I am blessed to be the granddaughter of Calvin Cecil Crutchleo, Sr., Seaman 10 SV6 USNR. 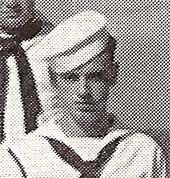 My grandfather was in active duty in the US Navy from 4/13/1943 until 11/28/1945. He held the ratings of AS, S2C, and S1C and served on the following vessels/stations: NTS Great Lakes, IL; USS West Virginia, USS Tamalpais. He was born June 1, 1921 and on November 26, 1942 he married my beloved Grandmother, Josephine Betty Fell in Cincinnati, Ohio. Cincinnati was home to my grandparents their entire lives. They had 2 children, my Aunt Donna Schmidt (1942?) and my Father, Calvin Cecil Crutchleo, Jr. (1946). My grandfather passed from this life into the next only a few weeks ago, on June 7, 2007. In his 86 years of life he worked as a TV repairman/Store owner (Beck TV in Cincinnati, Ohio) and built a cottage home on Kincaid Lake in Falmouth, KY where he and my Grandma and much of our family spent summer weekends from 1972 until approximately 1996. He enjoyed fishing, working in the garden, arguing about politics, playing with his grandkids and great-grand kids, playing poker, and was forever remodeling his home or shed or camper. He had a great sense of humor with a quick wit and was always playfully teasing my grandmother and us kids. He was extremely good natured and laid back and just fun to be around. He did speak of his time in the Navy and I will upload some of those stories in the near future.